The extremely cold weather has affected not only the comfort of our living conditions but also our safety on the road. That’s why the Illinois Department of Transportation (IDOT) urges Illinois motorists to be safe and aware of the potential dangers of traveling. •	Allow extra time for travel during the winter months. •	of vision is restricted. You may see them, but theymay not see you. •	Always keep your gas tank at least two-thirds full to help prevent the vehicle’s fuel line from freezing. •	Always wear a seat belt, front seat or back – it’s the law. 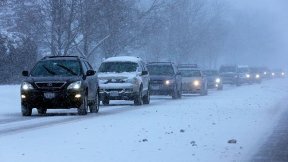 •	Check travel and road conditions routinely before any trip. You can get road condition information by calling 1-800-452-IDOT (4368), Illinois Tollway information by calling 1-800-TOLL-FYI or online at www.gettingaroundillinois.com and click on the “winter road conditions” icon.